Unlike traditional HEPA filters that can provide breeding grounds for bacteria and viruses, the DFS technology kills these harmful microorganisms, reducing the spread of sickness in the environment. 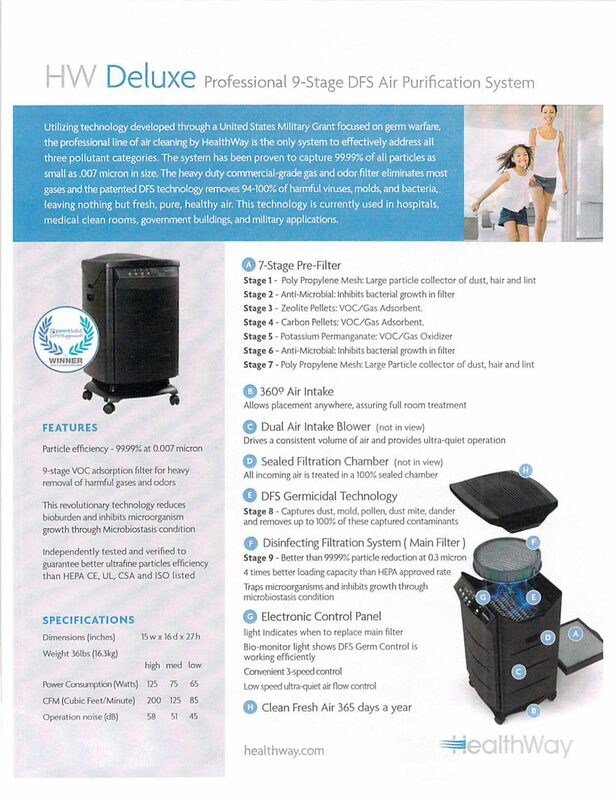 The HealthWay Air Purifier patented technology makes our air cleaners the best in their class for removing airborne particles, microorganisms, mold, fungus, odors and gases – ultimately providing a healthier living environment. And as an added bonus, many of our satisfied customers often report a reduction in the amount of dust in their homes and offices! Our portableHealthWay Air Purifier air cleaners are also ENERGY STAR® rated to help conserve energy and reduce operating costs. In the end the result is a cleaner, healthier environment which leads to a healthier, better quality of life for you and your family. Let us show you how we can transform your life with fresh, healthy water running through your entire house. The HealthWay 20600-3-DELUXE delivers clean FRESH air 365 days a year 24/7. Indicates when to replace Main Filter. Bio-monitor Light shows DFS Germ Killing Zone is working efficiently. Low speed ultra-quiet air flow control. Better than 99.99% particle reduction at 0.3 micron. Four times the particle holding capacity as a similar HEPA filter. Traps microorganisms for germicidal exposure. DFS GERMICIDAL TECHNOLOGY – Captures dust, mold, pollens, dust mite, debris, and more; and destroys up to 100% of these captured contaminates. 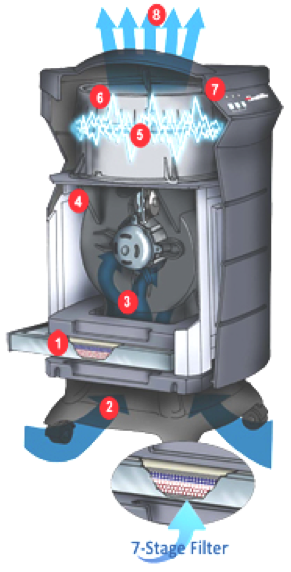 100% SEALED FILTRATION CHAMBER – All incoming air is treated in the 100% sealed filter chamber. DUAL AIR INTAKE BLOWER – Drives a consistent volume of air and provides ultra-quiet operation. 360 DEGREE AIR INTAKE – Allows placement anywhere, assuring full room treatment. Poly Propylene Mesh: Large particle collector of dust, hair and lint. Anti-Microbial: Reduces bacteria growth in filter.